Enriched uranium is a type of uranium in which the percent composition of uranium-235 has been increased through the process of isotope separation. Natural uranium is 99.284% 238U isotope, with 235U only constituting about 0.711% of its mass. 235U is the only nuclide existing in nature (in any appreciable amount) that is fissile with thermal neutrons. During the Manhattan Project enriched uranium was given the codename oralloy, a shortened version of Oak Ridge alloy, after the location of the plants where the uranium was enriched. The term oralloy is still occasionally used to refer to enriched uranium. There are about 2,000 tonnes (t, Mg) of highly enriched uranium in the world, produced mostly for nuclear power, nuclear weapons, naval propulsion, and smaller quantities for research reactors. The 238U remaining after enrichment is known as depleted uranium (DU), and is considerably less radioactive than even natural uranium, though still very dense and extremely hazardous in granulated form – such granules are a natural by-product of the shearing action that makes it useful for armor-penetrating weapons and radiation shielding. At present, 95 percent of the world's stocks of depleted uranium remain in secure storage. Uranium as it is taken directly from the Earth is not suitable as fuel for most nuclear reactors and requires additional processes to make it usable. Uranium is mined either underground or in an open pit depending on the depth at which it is found. After the uranium ore is mined, it must go through a milling process to extract the uranium from the ore. This is accomplished by a combination of chemical processes with the end product being concentrated uranium oxide, which is known as "yellowcake", contains roughly 60% uranium whereas the ore typically contains less than 1% uranium and as little as 0.1% uranium (Henderson 2000). After the milling process is complete, the uranium must next undergo a process of conversion, "to either uranium dioxide, which can be used as the fuel for those types of reactors that do not require enriched uranium, or into uranium hexafluoride, which can be enriched to produce fuel for the majority of types of reactors". Naturally-occurring uranium is made of a mixture of U-235 and U-238. The U-235 is fissile meaning it is easily split with neutrons while the remainder is U-238, but in nature, more than 99% of the extracted ore is U-238. Most nuclear reactors require enriched uranium, which is uranium with higher concentrations of U-235 ranging between 3.5% and 4.5%. There are two commercial enrichment processes: gaseous diffusion and gas centrifugation. Both enrichment processes involve the use of uranium hexafluoride and produce enriched uranium oxide. Reprocessed uranium (RepU) is a product of nuclear fuel cycles involving nuclear reprocessing of spent fuel. RepU recovered from light water reactor (LWR) spent fuel typically contains slightly more U-235 than natural uranium, and therefore could be used to fuel reactors that customarily use natural uranium as fuel, such as CANDU reactors. It also contains the undesirable isotope uranium-236, which undergoes neutron capture, wasting neutrons (and requiring higher U-235 enrichment) and creating neptunium-237, which would be one of the more mobile and troublesome radionuclides in deep geological repository disposal of nuclear waste. Low enriched uranium (LEU) has a lower than 20% concentration of 235U; for instance, in commercial light water reactors (LWR), the most prevalent power reactors in the world, uranium is enriched to 3 to 5% 235U. Fresh LEU used in research reactors is usually enriched 12% to 19.75% U-235, the latter concentration being used to replace HEU fuels when converting to LEU. Highly enriched uranium (HEU) has a 20% or higher concentration of 235U. 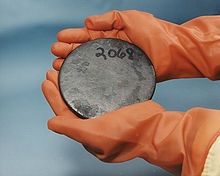 The fissile uranium in nuclear weapon primaries usually contains 85% or more of 235U known as weapons-grade, though theoretically for an implosion design, a minimum of 20% could be sufficient (called weapon(s)-usable) although it would require hundreds of kilograms of material and "would not be practical to design"; even lower enrichment is hypothetically possible, but as the enrichment percentage decreases the critical mass for unmoderated fast neutrons rapidly increases, with for example, an infinite mass of 5.4% 235U being required. For criticality experiments, enrichment of uranium to over 97% has been accomplished. The very first uranium bomb, Little Boy, dropped by the United States on Hiroshima in 1945, used 64 kilograms of 80% enriched uranium. Wrapping the weapon's fissile core in a neutron reflector (which is standard on all nuclear explosives) can dramatically reduce the critical mass. Because the core was surrounded by a good neutron reflector, at explosion it comprised almost 2.5 critical masses. Neutron reflectors, compressing the fissile core via implosion, fusion boosting, and "tamping", which slows the expansion of the fissioning core with inertia, allow nuclear weapon designs that use less than what would be one bare-sphere critical mass at normal density. The presence of too much of the 238U isotope inhibits the runaway nuclear chain reaction that is responsible for the weapon's power. The critical mass for 85% highly enriched uranium is about 50 kilograms (110 lb), which at normal density would be a sphere about 17 centimetres (6.7 in) in diameter. Later US nuclear weapons usually use plutonium-239 in the primary stage, but the jacket or tamper secondary stage, which is compressed by the primary nuclear explosion often uses HEU with enrichment between 40% and 80% along with the fusion fuel lithium deuteride. For the secondary of a large nuclear weapon, the higher critical mass of less-enriched uranium can be an advantage as it allows the core at explosion time to contain a larger amount of fuel. The 238U is not fissile but still fissionable by fusion neutrons. HEU is also used in fast neutron reactors, whose cores require about 20% or more of fissile material, as well as in naval reactors, where it often contains at least 50% 235U, but typically does not exceed 90%. The Fermi-1 commercial fast reactor prototype used HEU with 26.5% 235U. Significant quantities of HEU are used in the production of medical isotopes, for example molybdenum-99 for technetium-99m generators. Isotope separation is difficult because two isotopes of the same element have very nearly identical chemical properties, and can only be separated gradually using small mass differences. (235U is only 1.26% lighter than 238U.) This problem is compounded by the fact that uranium is rarely separated in its atomic form, but instead as a compound (235UF6 is only 0.852% lighter than 238UF6.) A cascade of identical stages produces successively higher concentrations of 235U. Each stage passes a slightly more concentrated product to the next stage and returns a slightly less concentrated residue to the previous stage. There are currently two generic commercial methods employed internationally for enrichment: gaseous diffusion (referred to as first generation) and gas centrifuge (second generation), which consumes only 2% to 2.5% as much energy as gaseous diffusion (at least a "factor of 20" more efficient). Some work is being done that would use nuclear resonance; however there is no reliable evidence that any nuclear resonance processes have been scaled up to production. Gaseous diffusion is a technology used to produce enriched uranium by forcing gaseous uranium hexafluoride (hex) through semi-permeable membranes. This produces a slight separation between the molecules containing 235U and 238U. Throughout the Cold War, gaseous diffusion played a major role as a uranium enrichment technique, and as of 2008 accounted for about 33% of enriched uranium production, but in 2011 was deemed an obsolete technology that is steadily being replaced by the later generations of technology as the diffusion plants reach their ends-of-life. In 2013, the Paducah facility in the US ceased operating, it was the last commercial 235U gaseous diffusion plant in the world. Thermal diffusion utilizes the transfer of heat across a thin liquid or gas to accomplish isotope separation. The process exploits the fact that the lighter 235U gas molecules will diffuse toward a hot surface, and the heavier 238U gas molecules will diffuse toward a cold surface. The S-50 plant at Oak Ridge, Tennessee was used during World War II to prepare feed material for the EMIS process. It was abandoned in favor of gaseous diffusion. The gas centrifuge process uses a large number of rotating cylinders in series and parallel formations. Each cylinder's rotation creates a strong centripetal force so that the heavier gas molecules containing 238U move tangentially toward the outside of the cylinder and the lighter gas molecules rich in 235U collect closer to the center. It requires much less energy to achieve the same separation than the older gaseous diffusion process, which it has largely replaced and so is the current method of choice and is termed second generation. It has a separation factor per stage of 1.3 relative to gaseous diffusion of 1.005, which translates to about one-fiftieth of the energy requirements. 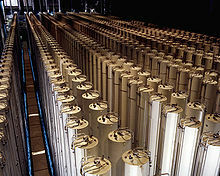 Gas centrifuge techniques produce close to 100% of the world's enriched uranium. The Zippe centrifuge is an improvement on the standard gas centrifuge, the primary difference being the use of heat. The bottom of the rotating cylinder is heated, producing convection currents that move the 235U up the cylinder, where it can be collected by scoops. This improved centrifuge design is used commercially by Urenco to produce nuclear fuel and was used by Pakistan in their nuclear weapons program. Laser processes promise lower energy inputs, lower capital costs and lower tails assays, hence significant economic advantages. Several laser processes have been investigated or are under development. Separation of Isotopes by Laser Excitation (SILEX) is well advanced and licensed for commercial operation in 2012. Atomic vapor laser isotope separation employs specially tuned lasers to separate isotopes of uranium using selective ionization of hyperfine transitions. The technique uses lasers tuned to frequencies that ionize 235U atoms and no others. The positively charged 235U ions are then attracted to a negatively charged plate and collected. Molecular laser isotope separation uses an infrared laser directed at UF6, exciting molecules that contain a 235U atom. A second laser frees a fluorine atom, leaving uranium pentafluoride, which then precipitates out of the gas. Separation of isotopes by laser excitation is an Australian development that also uses UF6. After a protracted development process involving U.S. enrichment company USEC acquiring and then relinquishing commercialization rights to the technology, GE Hitachi Nuclear Energy (GEH) signed a commercialization agreement with Silex Systems in 2006. GEH has since built a demonstration test loop and announced plans to build an initial commercial facility. Details of the process are classified and restricted by intergovernmental agreements between United States, Australia, and the commercial entities. SILEX has been projected to be an order of magnitude more efficient than existing production techniques but again, the exact figure is classified. In August, 2011 Global Laser Enrichment, a subsidiary of GEH, applied to the U.S. Nuclear Regulatory Commission (NRC) for a permit to build a commercial plant. In September 2012, the NRC issued a license for GEH to build and operate a commercial SILEX enrichment plant, although the company had not yet decided whether the project would be profitable enough to begin construction, and despite concerns that the technology could contribute to nuclear proliferation. Schematic diagram of an aerodynamic nozzle. Many thousands of these small foils would be combined in an enrichment unit. The X-ray based LIGA manufacturing process was originally developed at the Forschungszentrum Karlsruhe, Germany, to produce nozzles for isotope enrichment. 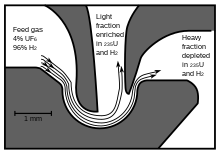 Aerodynamic enrichment processes include the Becker jet nozzle techniques developed by E. W. Becker and associates using the LIGA process and the vortex tube separation process. These aerodynamic separation processes depend upon diffusion driven by pressure gradients, as does the gas centrifuge. They in general have the disadvantage of requiring complex systems of cascading of individual separating elements to minimize energy consumption. 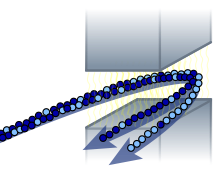 In effect, aerodynamic processes can be considered as non-rotating centrifuges. Enhancement of the centrifugal forces is achieved by dilution of UF6 with hydrogen or helium as a carrier gas achieving a much higher flow velocity for the gas than could be obtained using pure uranium hexafluoride. The Uranium Enrichment Corporation of South Africa (UCOR) developed and deployed the continuous Helikon vortex separation cascade for high production rate low enrichment and the substantially different semi-batch Pelsakon low production rate high enrichment cascade both using a particular vortex tube separator design, and both embodied in industrial plant. A demonstration plant was built in Brazil by NUCLEI, a consortium led by Industrias Nucleares do Brasil that used the separation nozzle process. However all methods have high energy consumption and substantial requirements for removal of waste heat; none are currently still in use. Schematic diagram of uranium isotope separation in a calutron shows how a strong magnetic field is used to redirect a stream of uranium ions to a target, resulting in a higher concentration of uranium-235 (represented here in dark blue) in the inner fringes of the stream. In the electromagnetic isotope separation process (EMIS), metallic uranium is first vaporized, and then ionized to positively charged ions. The cations are then accelerated and subsequently deflected by magnetic fields onto their respective collection targets. A production-scale mass spectrometer named the Calutron was developed during World War II that provided some of the 235U used for the Little Boy nuclear bomb, which was dropped over Hiroshima in 1945. Properly the term 'Calutron' applies to a multistage device arranged in a large oval around a powerful electromagnet. Electromagnetic isotope separation has been largely abandoned in favour of more effective methods. One chemical process has been demonstrated to pilot plant stage but not used for production. The French CHEMEX process exploited a very slight difference in the two isotopes' propensity to change valency in oxidation/reduction, utilising immiscible aqueous and organic phases. An ion-exchange process was developed by the Asahi Chemical Company in Japan that applies similar chemistry but effects separation on a proprietary resin ion-exchange column. 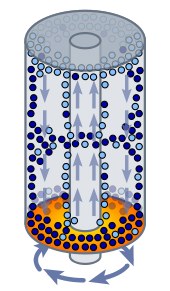 Plasma separation process (PSP) describes a technique that makes use of superconducting magnets and plasma physics. In this process, the principle of ion cyclotron resonance is used to selectively energize the 235U isotope in a plasma containing a mix of ions. The French developed their own version of PSP, which they called RCI. Funding for RCI was drastically reduced in 1986, and the program was suspended around 1990, although RCI is still used for stable isotope separation. In addition to the separative work units provided by an enrichment facility, the other important parameter to be considered is the mass of natural uranium (NU) that is needed to yield a desired mass of enriched uranium. As with the number of SWUs, the amount of feed material required will also depend on the level of enrichment desired and upon the amount of 235U that ends up in the depleted uranium. However, unlike the number of SWUs required during enrichment, which increases with decreasing levels of 235U in the depleted stream, the amount of NU needed will decrease with decreasing levels of 235U that end up in the DU. For example, in the enrichment of LEU for use in a light water reactor it is typical for the enriched stream to contain 3.6% 235U (as compared to 0.7% in NU) while the depleted stream contains 0.2% to 0.3% 235U. In order to produce one kilogram of this LEU it would require approximately 8 kilograms of NU and 4.5 SWU if the DU stream was allowed to have 0.3% 235U. On the other hand, if the depleted stream had only 0.2% 235U, then it would require just 6.7 kilograms of NU, but nearly 5.7 SWU of enrichment. Because the amount of NU required and the number of SWUs required during enrichment change in opposite directions, if NU is cheap and enrichment services are more expensive, then the operators will typically choose to allow more 235U to be left in the DU stream whereas if NU is more expensive and enrichment is less so, then they would choose the opposite. The opposite of enriching is downblending; surplus HEU can be downblended to LEU to make it suitable for use in commercial nuclear fuel. The HEU feedstock can contain unwanted uranium isotopes: 234U is a minor isotope contained in natural uranium; during the enrichment process, its concentration increases but remains well below 1%. High concentrations of 236U are a byproduct from irradiation in a reactor and may be contained in the HEU, depending on its manufacturing history. HEU reprocessed from nuclear weapons material production reactors (with an 235U assay of approx. 50%) may contain 236U concentrations as high as 25%, resulting in concentrations of approximately 1.5% in the blended LEU product. 236U is a neutron poison; therefore the actual 235U concentration in the LEU product must be raised accordingly to compensate for the presence of 236U. The blendstock can be NU, or DU, however depending on feedstock quality, SEU at typically 1.5 wt% 235U may used as a blendstock to dilute the unwanted byproducts that may be contained in the HEU feed. Concentrations of these isotopes in the LEU product in some cases could exceed ASTM specifications for nuclear fuel, if NU, or DU were used. So, the HEU downblending generally cannot contribute to the waste management problem posed by the existing large stockpiles of depleted uranium. A major downblending undertaking called the Megatons to Megawatts Program converts ex-Soviet weapons-grade HEU to fuel for U.S. commercial power reactors. From 1995 through mid-2005, 250 tonnes of high-enriched uranium (enough for 10,000 warheads) was recycled into low-enriched-uranium. The goal is to recycle 500 tonnes by 2013. The decommissioning programme of Russian nuclear warheads accounted for about 13% of total world requirement for enriched uranium leading up to 2008. The United States Enrichment Corporation has been involved in the disposition of a portion of the 174.3 tonnes of highly enriched uranium (HEU) that the U.S. government declared as surplus military material in 1996. Through the U.S. HEU Downblending Program, this HEU material, taken primarily from dismantled U.S. nuclear warheads, was recycled into low-enriched uranium (LEU) fuel, used by nuclear power plants to generate electricity. The following countries are known to operate enrichment facilities: Argentina, Brazil, China, France, Germany, India, Iran, Japan, the Netherlands, North Korea, Pakistan, Russia, the United Kingdom, and the United States. Belgium, Iran, Italy, and Spain hold an investment interest in the French Eurodif enrichment plant, with Iran's holding entitling it to 10% of the enriched uranium output. Countries that had enrichment programs in the past include Libya and South Africa, although Libya's facility was never operational. Australia has developed a laser enrichment process known as SILEX, which it intends to pursue through financial investment in a U.S. commercial venture by General Electric. It has also been claimed that Israel has a uranium enrichment program housed at the Negev Nuclear Research Center site near Dimona. ^ OECD Nuclear Energy Agency (2003). Nuclear Energy Today. OECD Publishing. p. 25. ISBN 9789264103283. ^ Thomas B. Cochran (Natural Resources Defense Council) (12 June 1997). "Safeguarding Nuclear Weapon-Usable Materials in Russia" (PDF). Proceedings of international forum on illegal nuclear traffic. Archived from the original (PDF) on 22 July 2012. ^ Alexander Glaser (6 November 2005). "About the Enrichment Limit for Research Reactor Conversion : Why 20%?" (PDF). Princeton University. Retrieved 18 April 2014. ^ a b Forsberg, C. W.; Hopper, C. M.; Richter, J. L.; Vantine, H. C. (March 1998). "Definition of Weapons-Usable Uranium-233" (PDF). ORNL/TM-13517. Oak Ridge National Laboratories. Archived from the original (PDF) on 2 November 2013. Retrieved 30 October 2013. ^ Sublette, Carey (4 October 1996). "Nuclear Weapons FAQ, Section 4.1.7.1: Nuclear Design Principles – Highly Enriched Uranium". Nuclear Weapons FAQ. Retrieved 2 October 2010. ^ Mosteller, R.D. (1994). "Detailed Reanalysis of a Benchmark Critical Experiment: Water-Reflected Enriched-Uranium Sphere" (PDF). Los Alamos technical paper (LA–UR–93–4097): 2. Retrieved 19 December 2007. The enrichment of the pin and of one of the hemispheres was 97.67 w/o, while the enrichment of the other hemisphere was 97.68 w/o. ^ "Nuclear Weapons FAQ". Nuclearweaponarchive.org. Retrieved 26 January 2013. ^ Frank N. Von Hippel; Laura H. Kahn (December 2006). "Feasibility of Eliminating the Use of Highly Enriched Uranium in the Production of Medical Radioisotopes". Science & Global Security. 14 (2 & 3): 151–162. doi:10.1080/08929880600993071. Retrieved 26 March 2010. ^ a b c d "Lodge Partners Mid-Cap Conference 11 April 2008" (PDF). Silex Ltd. 11 April 2008. ^ Rod Adams (24 May 2011). "McConnell asks DOE to keep using 60 year old enrichment plant to save jobs". Atomic Insights. Archived from the original on 28 January 2013. Retrieved 26 January 2013. ^ "Paducah enrichment plant to be closed. The 1950s facility is the last remaining gaseous diffusion uranium enrichment plant in the world.". ^ F. J. Duarte and L.W. Hillman (Eds. ), Dye Laser Principles (Academic, New York, 1990) Chapter 9. ^ "GE Hitachi Nuclear Energy Selects Wilmington, N.C. as Site for Potential Commercial Uranium Enrichment Facility". Business Wire. 30 April 2008. Retrieved 30 September 2012. ^ Broad, William J. (20 August 2011). "Laser Advances in Nuclear Fuel Stir Terror Fear". The New York Times. Retrieved 21 August 2011. ^ "Uranium Plant Using Laser Technology Wins U.S. Approval". New York Times. September 2012. ^ Becker, E. W.; Ehrfeld, W.; Münchmeyer, D.; Betz, H.; Heuberger, A.; Pongratz, S.; Glashauser, W.; Michel, H. J.; Siemens, R. (1982). "Production of Separation-Nozzle Systems for Uranium Enrichment by a Combination of X-Ray Lithography and Galvanoplastics". Naturwissenschaften. 69 (11): 520–523. Bibcode:1982NW.....69..520B. doi:10.1007/BF00463495. ^ Smith, Michael; Jackson A G M (2000). "Dr". South African Institution of Chemical Engineers – Conference 2000: 280–289. ^ Arjun Makhijani; Lois Chalmers; Brice Smith (15 October 2004). Uranium enrichment (PDF). Institute for Energy and Environmental Research. Retrieved 21 November 2009. ^ Australia's uranium - Greenhouse friendly fuel for an energy hungry world (PDF). Standing Committee on Industry and Resources (Report). The Parliament of the Commonwealth of Australia. November 2006. p. 730. Retrieved 3 April 2015. ^ BBC (1 September 2006). "Q&A: Uranium enrichment". BBC News. Retrieved 3 January 2010. ^ "Laser enrichment could cut cost of nuclear power". The Sydney Morning Herald. 26 May 2006. ^ "Israel's Nuclear Weapons Program". Nuclear Weapon Archive. 10 December 1997. Retrieved 7 October 2007. Look up enriched uranium in Wiktionary, the free dictionary. Poliakoff, Martyn (2009). "How do you enrich Uranium?". The Periodic Table of Videos. University of Nottingham. Gilinsky, V.; Hoehn, W. (December 1969). "The Military Significance of Small Uranium Enrichment Facilities Fed with Low-Enrichment Uranium (Redacted)". Defense Technical Information Center. RAND Corporation. This page was last edited on 16 March 2019, at 14:12 (UTC).